We’d love your help. Let us know what’s wrong with this preview of The Fitting Room by Kelly Minter. Kelly Minter explores what it meansin real lifeto "clothe" ourselves (Col. 3:12) in Christian virtues like forgiveness, joy, patience, compassion, and more. Can we really "dress up" in the character of Christ? Kelly Minter says the answer is yesif we let the Master Designer do the fitting. This relatable book offers insightful Scripture study with real-life stories and simple, down-to-earth explanations of tricky concepts such as justification and sanctificationstitching it all together with dry humor and down-to-earth honesty. There are no gimmicks, no guilt trips, just an irresistible invitation for women to enjoy a spiritual makeoverto put on a life that's personally tailored by the One who knows and loves them best. To ask other readers questions about The Fitting Room, please sign up. I cannot stress enough how important this book was (is) to me. It took me at least a month to get through it - that never happens. I had to go back and re-read chapters and really pray about the conviction weighing on my heart throughout this book. A-MAZING. I see it as a must read for everyone who strives to live out the virtues of Christ. It's something I'll definitely continue to refer back to often! The Fitting Room teaches us about Putting On The Character Of Christ. The book is based on Colossians 3:12 that says "Therefore, as God’s chosen people, holy and dearly loved, clothe yourselves with compassion, kindness, humility, gentleness and patience". Kelly Minter uses the analogy of fashion as a way of relating how we wear the 'virtues'... but she is quick to point out that "The Christian virtues are not something we can slap on ourselves like cutout paper dolls. They come as a result of h The Fitting Room teaches us about Putting On The Character Of Christ. The book is based on Colossians 3:12 that says "Therefore, as God’s chosen people, holy and dearly loved, clothe yourselves with compassion, kindness, humility, gentleness and patience". Kelly Minter uses the analogy of fashion as a way of relating how we wear the 'virtues'... but she is quick to point out that "The Christian virtues are not something we can slap on ourselves like cutout paper dolls. They come as a result of heart change that is accomplished through the supernatural love of Jesus." I thought this was a great book, well written in a personal way. I could relate to much of what Kelly was sharing... because I have experienced it myself. She points out how our we become focused more on managing our behavior rather than promoting inward transformation. After the first few pages, I was hooked. When she says that we can never separate the qualities of God from God Himself, I felt the conviction. She talks of how we view godly character as something we can obtain if we just try harder. Oh... how often I've been there! The way we tell ourselves that we'll do better next time, be more patient, hold our tongue, or just use the virtues at will... as if it's something we can do on our own. So much to learn in this book... I think it could be used in a small group as well. Kelly Minter makes it easy to read and enjoyable as well. I think you'll enjoy it. "The Fitting Room" is a very down to earth, discussion, one may have with a close friend or at bible study about putting the "character of Christ" as we go through our daily lives. Short chapters, laidback style, engaging anecdotal stories and scripture, "The Fitting Room" talks about the clothing of our character that is shown in and through Jesus Christ. This is a book that discusses that, yes, life isn't going to be perfect, we're not going to be perfect, but Jesus Christ, through what He has d "The Fitting Room" is a very down to earth, discussion, one may have with a close friend or at bible study about putting the "character of Christ" as we go through our daily lives. This is a book that discusses that, yes, life isn't going to be perfect, we're not going to be perfect, but Jesus Christ, through what He has done, is enough to clothed us in His image, not ours. It's about the realities that we're going to have our ups and downs, there's going to be days when our coffee orders may come out wrong or the washer and dryer decides to go out at the same time, but what "The Fitting Room" does is not only share stories and words of encouragment, but remind us that life isn't going to be perfect, but by following in our Father's footsteps, His grace is definitely sufficent for us. Written in a style that for the working mom, the busy stay at home and just the Christian sister who finds herself trying to balance everything, this isn't a book about impossibilties but a book about realities, that no matter what storms are in our lives, to encourage, strengthen and help us develop a strong character of compassion, strength and gentleness in and through Jesus Christ. "There are others who are all too aware of the characteristics of godliness but want nothing to do with them, because they were taught such virtues by people who didn’t actually live by those principles. For them, the notion of godly character was flaunted by hypocrites, self-righteous leaders, or possibly angry parents, and they haven’t wanted a piece of its polyester since. Yes, a lot of damage has been done in the name of God and Christian virtue; people have been clothed by reckless tailors. However, one of my greatest hopes is that if this has been your experience, you will give the discovery of authentic godliness another look, because biblical virtues are not punitive but life-giving." "The Fitting Room" goes straight to the heart of what having the character of Christ is about and doesn't promise, read this and overnight, but rather....is about having trust, faith, encouragement and even committment to allow Christ to work in and through us. Great book for small groups! Kelly Minter does an excellent job of not just talking about the virtues listed in Colossians 3:12 but she also breaks down the entire verse from start to finish. What does it mean to be chosen, dearly loved, justified, and holy. She's witty and graceful in the way she writes...and most importantly it's full of truth. I would highly recommend this for small groups and even to read as an individual. I enjoy Minter's writing, even if this book seems to assume an entirely female audience and the self-deprecating humor became a bit overdone by the end. I picked it up as free e-book and was interested in how she would talk about Colossians 3. The book offers a solid exposition of the meaning of the various words the chapter contains and a challenge to put on that new self. Perhaps not enough church in the talk of discipleship, but good nonetheless. As little girls, it’s fun to play “dress-up” and with “paper dolls.” As women, getting fitted for a prom dress, bridesmaid gown, or even a bridal gown. 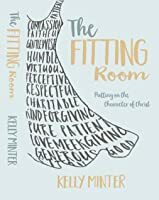 Kelly Minter, in her book, The Fitting Room, has provided a means for a spiritual makeover, one that lasts for eternity, by putting on the character of Christ. Kelly’s book has a down-to-earth feel to it, but she’s truly concerned about our spiritual growth. She feels like a friend sitting next to you and sharing spiritual truths while being trans As little girls, it’s fun to play “dress-up” and with “paper dolls.” As women, getting fitted for a prom dress, bridesmaid gown, or even a bridal gown. 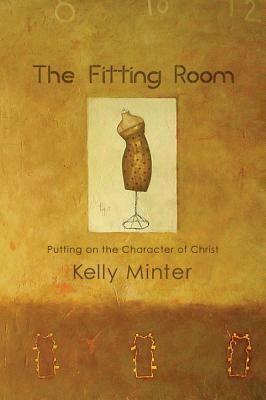 Kelly Minter, in her book, The Fitting Room, has provided a means for a spiritual makeover, one that lasts for eternity, by putting on the character of Christ. Kelly’s book has a down-to-earth feel to it, but she’s truly concerned about our spiritual growth. She feels like a friend sitting next to you and sharing spiritual truths while being transparent with her own walk with the Lord. She doesn’t claim to have all the answers, but she has a way of getting her points across that are easy to understand and peppered with her wit. The power to walk this life is given by the Holy Spirit and God’s holiness when by faith in Christ we are we are chosen by God. We are graciously chosen, loved by the Father, and called to live a holy life by putting off the old sinful nature. I was amazed at the wisdom set forth by Kelly in regards to these virtues. Yes, the wisdom comes from God, but He used Kelly to crack open the meanings in a very personal way. Again, she’s very transparent with her own life, which makes the book that much more meaningful and encouraging. If you want to truly change and learn to put on the character of Christ, this is a great book to study. Kelly explains how to take off the negative traits and emotional entanglements we grew up with. But remember, it’s a process, not a one-step rule and everything’s fine. God will work in you to produce His character in you if you are open for change. Great for personal or group studies. The cover of her book will bring back memories of childhood paper dolls and getting fitted for a gown. Kelly’s book goes deeper and is a necessary part of our lives. Struggling with self-image? Have you ever wondered what true beauty is? Tired of trying to meet the world's standards of beauty? When you look in the mirror what do you see? Come learn how God sees you and become the image bearer of the Great Designer. Be clothed in His glory and beauty. Become the woman you have always wanted to be - stunning, beautiful, breath-taking, lovely! Throw out that old wardrobe and exchange it for a heavenly one! Based on Colossians 2 Kelly Minter encourages readers to Struggling with self-image? Have you ever wondered what true beauty is? Tired of trying to meet the world's standards of beauty? When you look in the mirror what do you see? Based on Colossians 2 Kelly Minter encourages readers to clothe themselves in Godly things. Her casual and authentic writing style makes the reader feel as if they are sitting with an old friend. I believe this book would be excellent for a small group bible study. All women struggle with some form of insecurity (though some hid it very well behind a mask of perfection). In the fourteen chapters of this book Kelly addresses the many lies of this world that have convinced us that we must look, dress, and act a certain way to be accepted. Kelly replaces those lies with the Word of God and teaches ladies that we to must clothe ourselves in God's Word. I highly recommend this book for all women. This book appropriately and genuinely exalts Jesus. I loved Kelly's down-to-earth, easy-to-talk-to style of writing. I know the areas in which I've been rightfully convicted by the Holy Spirit that need changing, but it says something about the book that I didn't walk away from it down-trodden or trying to strive to be better, but to let Him "beautifully meddle" with me because He loves me. Kelly Minter has an enjoyable writing style. Her observation of life provides great insights from a fun and witty perspective. Each chapter takes on a character quality that we are to "put on" in our responses to life. My book club slowly read this book as we simultaneously read novels that exemplified (positively or negatively) the character quality. This was a great approach as it gave us meaty discussions around the fictional novels. I loved Kelly Minter's bible studies on 1 John and No Other Gods. She said in one of her videos that she strives to write about things once she learns to live them herself, but not this time. I agree with another reviewer that this would have been better as a study than a book. Kelly is witty and articulate, but it seems she is just talking about the ideas, not speaking from experience. Worth a read but not like her studies. Didn't finish it. Read this for our bible study supper group and we discussed a couple of chapters at each meeting. Easy to read style with good illustrations, we are enjoying Kelly Minter's books. The last few chapters on humility, compassion and patience were a good reminder and to see that selfishness gets in the way of wearing many of these virtues. A good one to go back and re-read to absorb more! Kelly Minter has a deep, yet witty style that was easy to read. I appreciate someone who can unpack the deeper truths of Scripture while also making me laugh by her real-world commentary. That is a difficult skill to pull off. I only had to read the first few pages of her book to get hooked. Kelly is from Reston, VA. Her father is the head paster at Reston Bible Church. Kelly Minter feels like someone you want to be friends with. Shes's insightful, honest, funny, and says things you've thought but never realized or admitted. I like this book but just like most Christian books, there's so much I want to remember and take away that its a bit overwhelming. But it's something I would recommend and will probably read again. I knew by chapter 3 that I would read this book more than once. God has blessed Kelly with the gift of writing words of wisdom and truth. So many items, I thought questions about a particular truth she mentioned only to have her ask the same question a few lines later--then answer it! I have recommended this book to several people even before I finished it. This book is so worth the read! I had a little trouble getting into this book, but as I read more I was continually encouraged and drawn into it. I loved her writing style and complete honesty. She shared lows and highs and how life is a combination, even as we're growing closer to Christ. A couple chapters I think she could have been more outward focused instead of mostly just telling us her experience, but overall I really learned a lot about myself and what God has done for me and how I can live out these virtues because of Him. Amazing. Kelly is so honest about herself that it's more like having a conversation with a good friend than reading a book. Her insights are helpful and you can feel her love coming through her words. Very well done. Insightful. Thought-provoking. Challenging. Doctrinally sound. I definitely recommend this book - for men as well as for women. I look forward to reading more of Kelly Minter's work. This book takes apart Colossians 3:12, which tells us to "clothe" ourselves in virtues like peace, patience, kindness, forgiveness and compassion. I like her style of writing, and her warmth and humor made this a pleasure to read. what a remarkable book about the characteristics of Christ. I felt like it was easy to read and she had a lot of humor. Made me feel like these things are achievable and would recommend this book to any christian, new or not. I loved this book. The authors straight-forward approach and honesty were very refreshing. She goes thru the different characteristics of Christ and tackles the topics of legalism and "do goodism". I would definitely read this again and would love to do it as a group study. I downloaded this as a free ebook, and I'm grateful for the gift. I thought it was a Bible study, though, so I was a little disappointed to find that it was a regular book. Kelly's a good writer with a tender soul. This would be a good gift for a friend with an artist's heart. Reading this for an in home weekly study with 6 other women. I find that Kelly Minter has a fresh voice and has an amazing way of taking the WORD and showing how it applies to the modern world. I look forward to completing this study. Excellent!! An irresistible blend of solid truth, humor and practical advice. Love Kelly's writing style. I love Kelly Minter's conversational writing style and how she peppers this inspirational book with both formal Bible teaching as well as fun personal stories from her own experiences. I really enjoyed this book. It challenged me and made me think of a few things differently without being preachy. The author is very real!! Kelly lives in Nashville, Tennessee, and serves the Lord passionately both across the U.S. and internationally in a variety of creative roles. An acclaimed author, musician, Bible study creator and teacher, she is passionate to see women impacted by Jesus and His Word. Growing up outside of Washington, DC, Kelly was raised in a Christian home, the oldest of four children and daughter of a pastor. H Kelly lives in Nashville, Tennessee, and serves the Lord passionately both across the U.S. and internationally in a variety of creative roles. An acclaimed author, musician, Bible study creator and teacher, she is passionate to see women impacted by Jesus and His Word. Growing up outside of Washington, DC, Kelly was raised in a Christian home, the oldest of four children and daughter of a pastor. Her childhood was seasoned with competitive sports, learning the guitar, singing, and a litany of church activities in the congregation her father founded and still pastors. Like many young women, Kelly dealt with inner struggles – anxiety and depression were a part of her growing-up years. “Those struggles are what drove me to Scripture,” Kelly says, “and the catalyst for me to learn for myself who God is.” Throughout her high school career, Kelly played basketball competitively, expecting that to be her path into college. But after a scholarship fell through, she began playing music. And God began a new thing. Kelly moved to Nashville in the summer of 2000 and released her first record with WORD, followed by a subsequent release on a different label, leading to her first #1 Single on the Inspirational Charts, This Is My Offering. Shortly after this success and several cross-country tours her record company folded leaving Kelly to rethink her vocation and ministry. In the middle of an ever-changing music industry and on a tour through Colorado, Kelly met a book publisher who would two years later sign her to her first book deal. Kelly’s first book eventually led to LifeWay approaching her about writing a bible study. Authoring curriculum was a new challenge, but one she quickly fell in love with. Kelly’s first three studies include, No Other Gods: Confronting Our Modern Day Idols, followed by Ruth: Loss, Love & Legacy and Nehemiah: A Heart That Can Break. Respected Bible Study teacher and speaker, Beth Moore, chose each of Kelly’s resources for three of her widely-reaching online summer studies. Thousands of women participated and were challenged by Kelly’s writing and her unique perspective on Scripture. Kelly now writes, teaches, and sings across the United States and also in other countries. Speaking at multiple conferences and events, as well as four Women of Faith events in 2012, Kelly has become a steady and respected teaching voice to women, particularly when it comes to the Scriptures. She also partners closely with Justice and Mercy International (JMI), a ministry that serves in the Amazon jungle; she especially loves working with the jungle pastors who encourage her through their remarkable faith.